For me, a critical piece of environmental leadership is engaging young people in the discussions, research, policy development and programming being done related to local and global environmental issues. I seek to do just that in my academic, professional, and personal endeavours. I am a human geographer with a particular interest in environmental education, participatory multi-media methods, and youth advocacy. I hold an Honours B.Sc. in Environmental Science (Co-op option) with a major in Environmental Geography from the University of Guelph, and completed my M.A. in Geography at McGill University in 2014. My Masters research with the Climate Change Adaptation Research Group under the supervision of Dr. James Ford built on work from my undergraduate thesis that explored Inuit youth observations and perceptions of climate change in Rigolet, Nunatsiavut, Labrador, Canada. Working in the same region and with the same community, my Masters project focused on youth resilience within a changing climate. More specifically, it highlighted youth-identified protective factors that enhance mental health and well-being for Inuit youth in Nunatsiavut, Labrador and discussed applications for climate change adaptation. Part of this work involved creating a participatory video in Rigolet, Nunatsiavut with students from the Northern Lights Academy, the ‘My Word’ Storytelling and Digital Media Lab, and Konek Productions. My interest in youth and climate change issues stems from personal experience as a youth environmental activist; in 2009 and 2010 I was part of the Canadian Youth Delegation to the UN Climate Change conferences (COP15 and COP16). Having been inspired by the tremendous passion and energy of youth delegates at these conferences, and with an interest in team facilitation, program development, and project management, I have pursued many extra-curricular activities with youth around environmental issues at both local and national levels. These initiatives include organizing workshops, symposiums and other events such as a campus-wide Sustainability Week, working as an executive committee member for the Sierra Youth Coalition of Canada, and acting as Program Director for an environmental charity running eco-footprint themed summer camps in Victoria, BC. 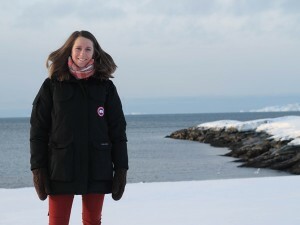 Most recently, as a Project Manager for the Climate Change Adaptation Research Group, I focused on food security in the North, specifically looking at country food markets in Greenland and documenting important considerations for similar initiatives in a Nunavut context. When not busy with academic or extra-curricular pursuits, I pursue my passion for travelling, enjoy cooking and consuming good food, and try to spend as much time as possible in nature. During my Masters work, I was a recipient of the Joseph-Armand Bombardier Canada Graduate Scholarship (through the Social Sciences and Humanities Research Council), the Nasivvik Centre Graduate Scholarship for Community-Based Research on Environment & Health with Inuit, and the James Maxwell Studentship in Human Geography from the Royal Canadian Geographic Society. In 2011, I was named the 2nd finalist of the Top 25 Environmentalists Under 25 in Canada by Starfish, an online environmental blog. Currently, I have four peer-reviewed publications (three of which were on my Masters work), have presented at over 10 international conferences (both oral and poster presentations), and have given over 20 invited talks and guest lectures for university, elementary/high school, and public audiences. Youth in Rigolet, Nunatsiavut working with Jordan and Curtis Konek from Konek Productions and the ‘My Word’ Storytelling and Digital Media Lab on filming footage to contribute to a participatory video they called “Life in Rigolet”.